Go from ho-hum picnic to al fresco pizzazz with these perky picks. Substitute any of the above with your favorite antipasto ingredients. Other options include marinated mushrooms, black olives, sundried tomatoes, roasted garlic cloves, salami, other cheeses, or even cooked cheese tortellini or ravioli (though technically not "antipasto"). Thread 1-2 pieces of each ingredient onto skewers in any order until they are used up. Tip: Stand the skewers up in a pitcher or large vase, bouquet-style, to double as a deli-cious centerpiece for a party. Looking for a super-quick and simple appetizer for your soiree? Give this one a try! Preheat oven to 350 degrees. If using raspberry jam, cut brie in half horizontally and spread a thick layer of jam on one half; top with the other half. Wrap entire brie wheel in the puff pastry and press edges together to form a seal (make sure there are no holes). It's okay to bunch the dough where it meets at the top, but you can also cut away some of the excess if it is too much. Place covered wheel on a baking sheet sprayed with non-stick spray. Mix together egg and water and brush over exposed areas of the wheel. Bake for approximately 20 minutes or until pastry is golden brown. Remove and serve with crackers or french bread slices and some grapes for a nice touch. Satisfy that craving for buffalo wings with a fraction of the fat, calories and MESS! Shred the chicken and finely chop the vegetables; combine in a medium bowl and set aside. In a smaller bowl, mix together cream cheese, blue cheese dressing and wing sauce. Add to chicken mixture and toss to combine. Serve with crackers or corn chips. Mix together the first 4 ingredients until smooth. Stir in chocolate chips and serve with broken cone pieces. Yup, it really is that easy! 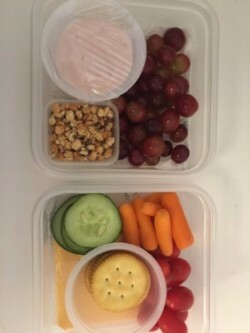 This is such a simple, quick, and healthy way to get your picky kids to eat more fruit or jazz up your party fruit tray. Take it to the pool or to your next picnic or potluck. Simply mix together until well combined and serve with a variety of bite-sized fresh fruit.